Police told the BBC that a car filled with explosives had rammed a bus carrying the troops to Srinagar. 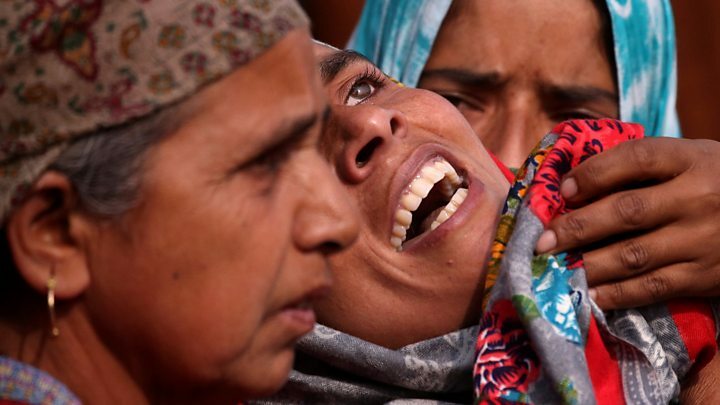 Pakistan-based Islamist group Jaish-e Mohammad said it was behind the attack. It is the deadliest militant attack on Indian forces in Kashmir since the insurgency against Indian rule began in 1989. India’s prime minister described the attack as “despicable”. The blast took place on the heavily guarded Srinagar-Jammu highway about 20km (12 miles) from the main city in Indian-administered Kashmir, Srinagar. 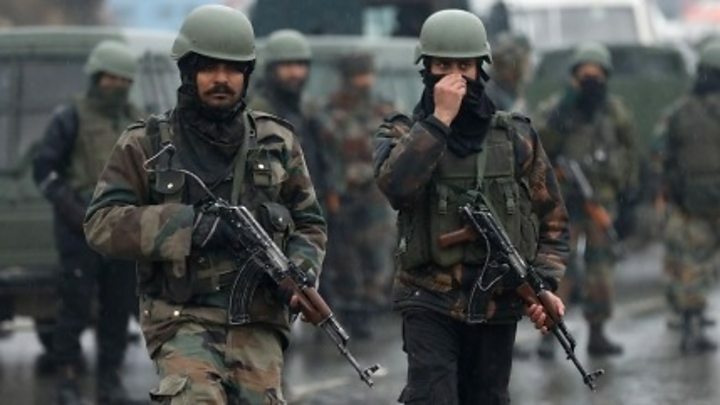 Indian media reports said that at about 15:15 local time (09:45 GMT) a car carrying between 300 and 350kg (660-770lb) of explosives struck a convoy of about 70 vehicles that was carrying about 2,500 troops to the Kashmir Valley. “A car overtook the convoy and rammed into a bus with 44 personnel on board,” a senior police official told BBC Urdu’s Riyaz Masroor. The official said the death toll might increase because dozens were “critically injured”. The highway had previously been closed for a week because of snow, reports said. AFP news agency said Jaish-e Mohammad had told local media it had carried out a suicide bombing. Indian Prime Minister Narendra Modi has strongly condemned the attack. Home Minister Rajnath Singh said Jaish-e-Mohammad was “Pakistan-based and Pakistan-backed” while Finance Minister Arun Jaitley said those responsible would be given an “unforgettable lesson for their heinous act”. Two former chief ministers of the state, Omar Abdullah and Mehbooba Mufti, have also tweeted about the attack. The Indian security establishment had been chest-thumping in recent months on how they managed to contain the insurgency. This attack though is a reminder the conflict is far from over. The incident could increase tensions between India and Pakistan. The Indian government had already pointed the finger at Pakistan for allegedly supporting militant groups like Jaish-e-Mohammad. Pakistan denies those accusations. Some blame India’s Hindu nationalist BJP government for not initiating steps to start peace negotiations with Kashmiri groups and also with Pakistan. The Indian government faces a dilemma – any strong-arm tactics will further alienate the Kashmiri population. But not being seen to be doing anything on the ground will not augur well for Mr Modi, who is seeking re-election in a couple of months. Bashir Manzar, a journalist based in Indian-administered Kashmir, said the bombing would boost the morale of militants and contradicted claims the situation in Kashmir is being brought under control. “Over the past few months, political leaders in Srinagar and Delhi have made tall claims about how the situation in Kashmir has been normalised and hundreds of militants, including top leaders, had been killed,” he told the BBC. The two countries have fought three wars and a limited conflict since independence from Britain in 1947 – all but one were over Kashmir. Started by cleric Maulana Masood Azhar in 2000, the group has been blamed for attacks on Indian soil in the past, including one in 2001 on the parliament in Delhi which took India and Pakistan to the brink of war. It is also said to have introduced suicide bombings in Kashmir, with the first such attack taking place in 2000. However Maulana Masood Azhar remains at large and is reportedly based in the Bahawalpur area in Pakistan’s Punjab province. India has often demanded Maulana Masood Azhar’s extradition from Pakistan but Islamabad has refused, citing a lack of proof.